Silurian stories can be oddly one note. To an extent, for much of their existence, the Silurians haven’t been so much a monster as a story trope – the same singular story retold in various ways. It’s understandable - Doctor Who and the Silurians is a magnificent piece of work and a highlight of early seventies Doctor Who. And divorced from its central conflict of newly awakened ancient owners of the Earth having to choose between living alongside the upstart humanity or retaking their world by force, the Silurians are arguably just a bunch of standard reptile men with an inexplicable heat ray in their forehead. But with The Sea Devils, Warriors of the Deep and The Hungry Earth all ploughing the same vein of inspiration, it’s a mine that risks being played out. Love it or loathe it, at least Dinosaurs on a Spaceship succeeded in being a completely different type of Silurian story. The same can’t really be said of Bloodtide. Hitting many of the same standard plot beats in its first half, we meet a newly awoken Silurian colony, a plot to cleanse the Earth of the ‘apes’ infesting its surface, and a power struggle between the group’s more militant and more tolerant factions, you’d be forgiven for thinking you know exactly where it’s going almost from the beginning of the journey. However, to its credit, it does try hard to distinguish itself and add a new wrinkle to the well-worn formula. Unfortunately, the main way it does this is to transplant some familiar Doctor Who ideas from elsewhere in its canon. I’m not sure the Silurians were ever crying out for their own Davros style figure yet, in the person of Tulok, that’s what we get. Cunning, sly and political, Tulok is less up front than his reptilian predecessors and rather than openly confronting any hint of weakness from his own kind with challenges, he lies and wheedles to push them into conflict. 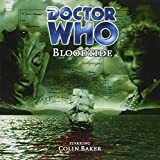 More than that, with shadows of Davros’ conspiracy to destroy the Kaled Dome, Tulok proves himself more than prepared to kill huge numbers of his fellow Silurians in order to ensure his own mad scientist dreams come true. Another major influence here merged with the Genesis of the Daleks vibe, is classic British SF horror Quatermass and the Pit. For the abomination which Tulok has genetically engineered to the disgust of his peers aren’t Daleks… they’re us. And, moreover, like the Martian altered humans of Kneale’s film his tinkering with ancient human biology has given Tulok a backdoor into the human brain – giving his Silurians third eye a somewhat bizarre new superpower: mind control. Doctor Who and the Silurians, Genesis of the Daleks, Quatermass and the Pit; this is a high-quality crop of ingredients to mix into your creation but the resulting concoction doesn’t really work. Part of this is the way they combine to fight against the script’s other big idea: Charles Darwin. It’s always been one of the tightropes which Doctor Who has had to walk in showing aliens engaging in human history – trying not to take away from either the heights of human accomplishment nor the depths of very human evil by giving either the credit or the blame to outside influences. A young Darwin encountering a Silurian colony beneath the Galapagos was always going to risk portraying him as not developing his Theory of Evolution through hard work and genius but simply reporting on what he’d learned. But Bloodtide ups the ante by having him confronted by evidence that the human race was engineered, not the result of some natural process. It tries to turn this into a benefit by having him declare his faith in evolution and the ascent of man despite the evidence of his own experience – a faith which to an extent allows him to fight off Tulok’s psychic control – but that, with its echoes of Curse of Fenric, simply positions evolution as a belief in the same category as religion or socialism rather than a simple scientific fact. It all makes for a rather confused way of praising Darwin for his vision. Ultimately, Bloodtide gathers some high-quality parts from well-renowned suppliers but assembles them in a way that causes them to grind painfully against one another. If nothing else it illustrates just how hard it really is to try and play with the Silurian formula.